Most of us have heard about the benefits of meditation. Not as many of us know about the benefits of artistic expression. I believe creating art is a way to experience a meditative state of mind and the profound benefits it brings. For many years I have known that doing artwork gives me a sense of freedom and timelessness. When I paint, my focus is complete, I don’t notice the passing of time or feel any of my physical ailments. I’ve never tried to put this experience into words but have just enjoyed the process and the way it makes me feel. It was a treat to find that his book captures in words and drawings the feelings I have struggled to pass on to my students in my workshops. Today I help my students understand Mr. Lee’s concept, by getting them to do art. They soon learn the feeling of meditation by experiencing meditation themselves. I have tried and practiced many forms of art over the past 20+ years. Of all these forms acrylic pouring seems the perfect candidate to introduce painting as meditation. The mixing, stirring, sorting, layering and pouring provides repetitive movements that naturally lends itself to meditation. We let go, relax our body, focus on the seemingly simple steps we follow, and time passes without our noticing that both our body and brain relax. I believe the creative process in making art is healing and life enhancing. It helps one to increase awareness of self, to cope with physical symptoms, and to adapt to stress and trauma. Consider the following three ideas of why creative art activity is such a potent recipe for psychological and physical well-being. Art is a vehicle for meditation and self-connection. Research has shown the power of meditation and the science behind it. One reason art is so powerful is that it fosters self-acceptance. Creating art is a type of meditation, an active training of the mind that increases awareness and emphasizes acceptance of feelings and thoughts without judgements. It is relaxation of the body and the mind. Art, like meditation, lets us create space between negative thoughts and allows us to connect with our true selves. Art provides a feeling of flow and freedom. As in meditation, art can help us to tap in to a deeper, more quiet part of ourselves. We naturally enter a state of flow and present-moment awareness. Eckart Tolle writes, “All true artists, whether they know it or not, create from a place of no-mind, from inner stillness.” Artists experiencing that creative activity have the potential to tap in to a space of true consciousness of being, void of interpretation. In this space there can be a sense of having no physical parameters. Art allows for true self-expression. Creativity is its own language and enables people to connect with one another—and themselves—on a non-verbal level. Since art exists within its own non-verbal parameter, it frees us for unadulterated self-expression. Overall, I believe pouring leads to enhanced body and brain health through a meditative process. Meditation and art do the same thing: they both calm the mind and body in a healthy and positive way. Susan Soffer Cohn started training as an artist in the early 1990’s, after degrees in English and Business Administration. Due to the fine caliber of master teacher who mentored her, the unlikely results of becoming a full time artist came to fruition. She is very experimental and loves to mix media to see what will happen. 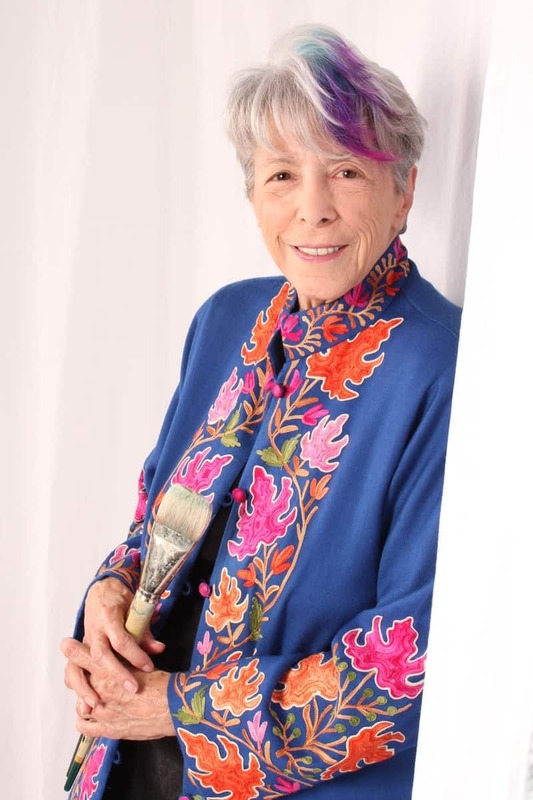 Susan paints, teaches, exhibits and sells her work. It has been shown in France, Sweden, Italy and Dubai, UAE as well as throughout the USA. Thank you for the interesting article. I agree that art can bring us so many positive things. What a fantastic article! Thank you for directly connecting the processes of creating art and meditative experience. I am an elementary educator and just finished doctoral research on my students’ experiences with mindfulness in my own classroom. 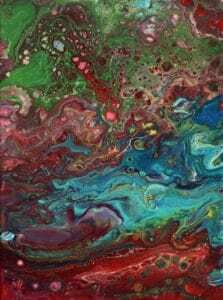 I find in my own practice and found in those practices of my students the connections between mindfulness and creation of art (acrylic pouring, sculpting with clay, painting, drawing, building with Legos, etc.). 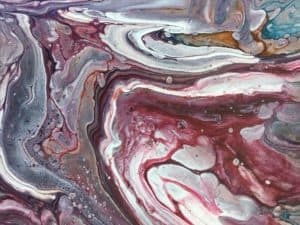 It was wonderful to read your list of what acrylic pouring leads to as connections to any other mindfulness practices. 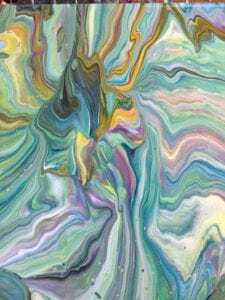 I needed to see that list to help me better articulate to others the ways the two connect, as I am currently working on my own inquiry into acrylic pouring. I’m so encouraged to find out about ways that people are finding space for mindfulness and/or meditation in their creative work.